Cynthia Jeanne Bowers (also Jeanne Shaheen; born January 28, 1947) is an American politician She is a member of the U.S. Democratic Party. In 1996, Shaheen became the first woman to be elected Governor of New Hampshire. 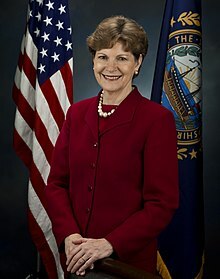 In 2008, Shaheen was elected to the United States Senate. Since 2011, she has been the senior senator from New Hampshire. Shaheen was born in Saint Charles, Missouri. ↑ "Jeanne Shaheen". U.S. Senate. Retrieved September 21, 2014. This page was last changed on 29 June 2018, at 06:47.